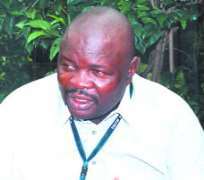 He was with Wale Adenuga for about 20 years and rose to the position of Marketing Manager. But today, he is on his own making money and doing things he learnt from his mentor. He told ShowbizNow on how it was at the very beginning. How is Face to Face doing? We are very grateful to the Almighty God for the wonders he has been doing in our programme. We started Face to Face about three years ago, and today saying it is a household name in the industry is saying the least. If you look at the concept of Face to Face, it's a comedy programme that is why we change our concept often. We don't want something that is boring. Different ideas have been implemented in a modern way because we don't want to make it a local programme. We try to rework Face to Face to be a glamour programme because of our society. It's a wonderful job. Why did you choose to do soap opera on face me I face you? I'm very sorry to say, but we all know that this country is spoilt and we need something to cool people's tension down. You can't watch Face to Face and not laugh. We do a comedy that will give people rest of mind. We want to make people laugh and that's why we choose to do something on the face-me-I-face-you phenomenon. How are you doing advert wise? Face to Face is doing very well advert-wise because we get a lot of adverts. Right from when we started Face to Face till today, we have been getting a lot of adverts. We have been getting a lot of support from powerful agencies like Media Reach, Globacom, Starcomms, Centre Spread. We are getting very heavy Advert support from them. Where does this programme air on TV? We are on 27 stations in and out of the country and their time are not the same. On Silverbird it is 7.30 Saturday morning, it aired on NTA Channel 10 by is 7.30 on Tuesdays, channel 8 is 7.30 on Wednesdays. We are all round but not yet on AIT. Discussion is going on to be on their network. We have Family Ties on AIT and it is one of the best programmes on the network. Face to Face is a programme that cuts across grassroots. You said you have been getting many adverts, how does it feel that a relatively unknown person is coming up to pull this kind of stunt? There are so many programmes that come on air and after a quarter they pack up. I will say it's the help of God. Sometimes, I even wonder on our achievements. It is by the power of God. How have you been surviving being an independent producer? We survive through adverts, through the patronage of advertising agencies. I am a marketing person. When I wanted to start, I did my home work well and the agencies welcomed me. How easy is it to be a soap opera producer? It's not easy. You have to be very creative. I don't just accept stories. I have a production team that works on stories and we do lots of research. How many staff did you start with? I started with about five staff and we are about 30 today. Where did you get money to pay them when you started? Whether I'm going to borrow it or not I must pay on the 30th of every month, it must not enter the following month, it's something I learnt from Wale Adenuga. Many times I had to borrow from my wonderful wife and don't forget that what I pay then is not what I pay now. I increase salary at will. Do you want to take over from Wale Adenuga?